The City of Compton election results will not be finalized until April 27. There are approximately 1,713 ballots that still need to be counted. These votes include provisional ballots, vote by mail and ballot drop offs. Before ballots could fully be counted on election night, a bomb threat took over Compton City Hall, halting election activity for a few hours with the threat later being charged to a false alarm. 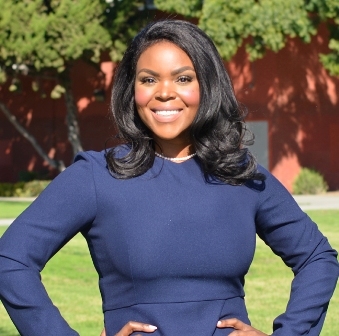 The voting count reported on election night (April 18) for the city of Compton mayor’s race, listed Mayor Aja Brown as the leader with 47 percent of the vote and Omar Bradley in second place with 29 percent of the vote. When the final votes are tallied later this month, if Brown does not hold on to more than 50 percent of the vote, she will have to compete in a special runoff election. As the race for mayor went low, Mayor Brown went high. Opponents of Brown taunted her with campaign flyers but she stayed humble and diligent and took the high road by not partaking in the same acts. “Thank you for the love, support and prayers throughout this entire election process,” Brown said via a statement released this week. “For those who voted to finish the work with us, thank you. To every single person who picked up a phone and called someone on our behalf, knocked on doors, hung signs, helped out in the campaign office, liked, shared and retweeted news about our campaign--thank you. To all of our supporters in Compton and beyond--thank you! During the campaign, you could find Mayor Brown talking to voters about her vision for the city of Compton. Her plans include $75 million to beautify the city and implementing Measure P. A bill she presented in 2015 and was passed in 2016. Measure P adds a one percent sales tax to fund repairing local streets, sidewalks and enhancing pedestrian street lighting. Additionally, the measure provides funding for more public safety personnel including sheriffs, firefighters and paramedics, expands youth job training, gang and drug prevention programs, economic development, improves local parks and stabilizes basic services throughout the city. The estimated annual revenue to the city of Compton will generate over $7 million annually and would require citizens’ oversight. If Mayor Brown is reelected, she plans to jump into Phase 1 of Wilmington repaved which will take place from El Segundo Blvd. to Rosecrans Ave. In addition, she plans to continue with the Compton movie theater ground breaking, residential reconstruction, downtown Compton revitalization, citywide street construction, lighting and park improvements, creating jobs, collaborating with Dr. Dre’s youth performing arts center and supporting the local rolling skating rink and bowling alley. Mayor Brown made it clear she is just getting started. At press time, the other Compton election results saw Councilman Isaac Galvan leading in the Council District 2 race with 58 percent of the vote. Councilman Tana McCoy was leading in the Council District 3 race with 39 percent of the vote. Craig Cornell was leading in the City Attorney’s race with 65 percent of the vote. Alita L. Godwin was leading in the City Clerk’s race with 53 percent of the vote. Douglas Sanders was leading in the City Treasurer’s race with 46 percent of the vote. For more updated City of Compton election news visit www.lasentinel.net.